Let’s make it from scratch. 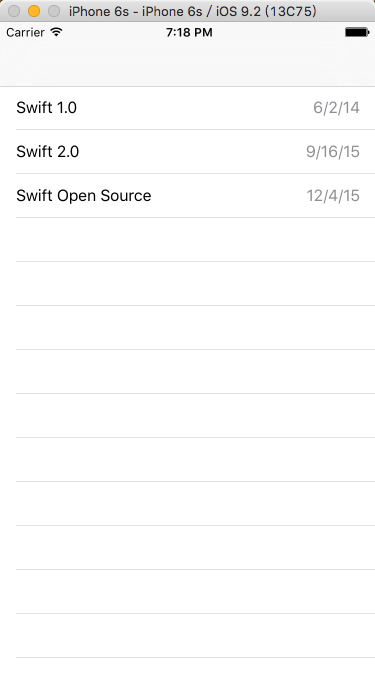 Create a new Project in Xcode, and choose the iOS\Application\Single View Application templete. After creation of the project, open Main.storyboard, delete the initial view controller, drag a Table View Controller into the storyboard and make it the initial view controller. 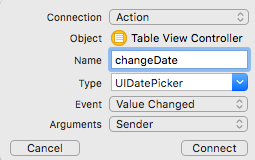 Then delete ViewController.swift in Navigator, go to File\New\File…, choose the iOS\Source\Cocoa Touch Class templete, name the class TableViewController and make it a subclass of UITableViewController. Then back to Main.storyboard, select the Table View Controller, change its class to TableViewController using the Identity Inspector (3rd tab). These are the preparatory work. Next, select the table view, set Prototype Cells to be 2 since we need two kinds of cells, one for displaying info of an event and one for displaying the date picker. Choose the style for the cell Right Detail and Custom, set the identifiers for them to be EventCell and DatePickerCell respectively. The second cell should be big enough to show the date picker properly, so set its row height (about 200 points) using the Size Inspector. Drag a Date Picker into the second cell and make them the same size using constraints. Before showing the date picker when we select a row, we should display a list of events correctly. Since we will display the time of an event, an NSDate object, we need a date formatter to obtain a string. We need an array property to hold some events. Run the app, the table view displays three events just as we expect. But no matter which row you select by tapping, nothing happen. Now it’s time to implement showing inline date picker when you select a row. Though this is the toughest part, we have prepared anything for it, let’s continue. There is no date picker shown, we tap a row, then a date picker is shown just under it. 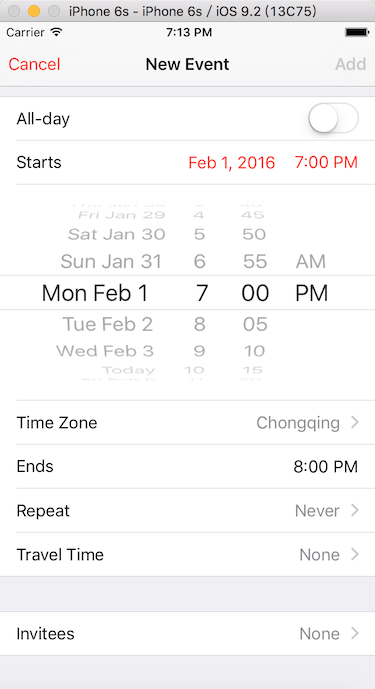 A date picker is shown, we tap the row just above it, then the date picker is hidden. The demo project is here.